Update 10:50 pm: price is now $65, which makes it just free after rebate. Buy the Kaspersky Internet Security 7.0 3-user direct from amazon for $56.99 with free shipping. There is a $65 rebate that expires today (December 31). price after rebate is -$8.01! If you already have a previous version of Kaspersky Internet Security, you can get an additional $25 rebate for upgrading to this one. Go to www.allrebates.com. EXPIRED: Kodak: 20 free 4 x 6" prints and Free Photo Mug! Sign up for a new Kodak account and get 20 free 4 x 6" prints and a free 11 oz photo mug. If you want a 15 oz photo mug instead, choose the 15 oz and apply code: SWEETRETURN at checkout. Shipping total is $5.50 - Great price for a nice mug. Most photo sites will give free prints for signing up but a free photo mug is unusual. Review: Google Checkout - Free credit card processing! Update: As of February 1, 2008 Google charges a 2% processing fee plus 20¢ per transaction. Donations to non-profit organizations are still free though! Google has an amazing product called Google Checkout which allows anyone to easily process credit card transactions. Google Checkout means totally free credit card processing! All other credit card processing companies withhold a percentage of the amount charged to the card. In addition to that, there are fees per transaction etc. I personally have used Google Checkout to charge tuition for a camp I ran last summer, and it worked flawlessly. Why would you use this even if you don’t have a store? If someone needs to pay you a sum of money, and cash isn’t the best option, just send them a Google checkout invoice via email. They pay you, using their credit card which they already have on file with Google. Google will give you the FULL amount. If you send someone a bill for $100, Google will deposit the full $100 in your bank account! No credit card processing fees at all! All this will last until February 1, 2008 at which time Google will start charging a 2% processing fee plus 20¢ per transaction. Click here to sign up for Google Checkout. If you are a non-profit organization however, Google will allow you to get donations with no fees until 2009!!! So you can put up a Google Checkout button on your site for donations. You will receive the full amount that was donated. If you are a non-profit, be sure to take advantage of this amazing offer! Click here if you are a Non Profit organization. 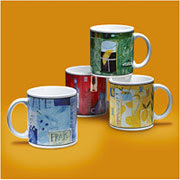 Four-Piece Mug Set - $5 W/Free Shipping! Update 12/29: Shipping is now only free for orders over $50. Staples has these coffee mugs on clearance sale for $5 with free next-day shipping! I just got these and they are quite nice. Artsy design, solid feel. EXPIRED: Hurry! Linens 'n Things - Black & Decker sale! Starting December 26th, get any of these products for $29.99 and they will send you a $25 Gift Card to spend at Linens 'n Things. With each item you buy, you get another $25 card. If you like to shop at Linens 'n Things, this is an amazing deal! Hurry, these will not last long! Choose in store pick-up to save on shipping! Remember, the $25 rebate is not cash, it’s a gift card at Linens 'n Things (which expires after 120 days). So, If you live near a LNT store (no shipping charges...) and you like to shop there (so you will have good use for the gift card), then this deal is amazing. You can get your report once a year from each of the three credit reporting agencies, which are Transunion, Equifax and Experian. You can either get all three of them at the same time, or get one every few months. When you apply for a credit card or any type of credit (mortgage, telephone etc), the company will first check your credit report to ensure that you will be a customer of good standing. This will help the company determine what line of credit you should get (if any). You should check your credit reports to make sure it is all correct. You can also make sure that no one stole you’re identity - for real! If you find mistakes, tell the reporting agency to correct it. Note: This does not get you a free credit score, only your credit report. EXPIRED - Hot! - Mini Vacuum cleaner - $9.99 on Amazon - Free shipping! Do you need a portable vacuum cleaner? If you don't see the $9.99 price, click on"Used and new from $9.99", and get it direct from Amazon. Eligible for free standard shipping - even if you just buy one! Get 4 for $29.97 with free shipping! Only downside is that it won't ship till the end of January. EXPIRED: Hurry! Hotels.com - $20 off a night!!! It will take $20 off your hotel room price as long as the hotel room cost more then $20 a night before coupon. You can use this code even if you are staying just for one night! So if you need a few nights, reserve one night at a time. Amazon is selling the Canon SD800 for $199.94 - free shipping! A great price for a great camera. If you are looking for such a camera, get it now before it sells out. Coupon no longer available - Order it today and receive a coupon for a 12-month photo calendar (a $19.99 value) from Shutterfly! EXPIRED - Creative Live! Cam with Voice. FREE AR! from Amazon for free after $60 mail in rebate. Doesn't have amazing reviews, but hey it's free. Dell Home has a very well equipped XPS m1530 15" laptop for $1024 or $993 if paying with Dell Preferred Account with free shipping. Update: GrandCentral Upgrades To Google Voice! Update 04/25: Grand Central currently is not allowing invites. Hopefully its only temporary! Grandcentral.com, currently in Beta, is an amazing phone tool. And its totally FREE. It gives you your own local number anywhere in the US which you in turn can forward to any number in the US, along with a whole lot of features. Hear who is calling before you answer the phone. 1) If you keep on changing numbers and want to have just one number that you can always be reached on, you don't have to keep on notifying all your contacts of a new number, because you can just make your Grand Central number forward calls to the new number. 2) If you are moving to another state, but keeping your cell phone and original number, and want to have a local number where people can reach you on. Get a Grand Central local number where you live, forward all calls to that number to your cell phone, keep your old phone (and number) and jut tell people your Grand Central number. 3) If you want people to always be able to reach you: if Grand Central usually reaches your home phone and you'll be away for a while, you can make it reach a phone at your destination... or your cell phone while you're en route. 4) If you have a basic landline without Caller ID or voicemail (i.e. you have Lifeline). If you give people the GrandCentral number, it will provide you with those features for free! 5) If your plan doesn't include long distance, you can use Grandcental to call anywhere in the US or Canada. 6) If you have internet on your phone you call Canada for free (just using your regular minutes) using Grand Central Mobile. 7) You can listen in to someone leaving you a message, then decide if you want to answer that call or not. 8)If you answer the phone on your cell phone, you can transfer the call to your landline just by clicking *. Check out their site for everything it can do. Make sure to read the review on The Gizmo Project to make this really work for you. Google claims the basic forwarding service will always be free. What exactly they consider the 'basic' part I am not sure, but for now everything is free. As of now you need to get invited by another Grand Central user. Post a comment or email me at dealreviews@gmail.com for an invite. Welcome to Deal Reviews! I will try and post whenever I come across a great deal / card. When I have time I will post reviews about great products and money saving tips.